Concrete piles and drilled shafts are an important category of foundations. Despite their relatively high cost, they become necessary when we want to transfer the loads of a a heavy superstructure (bridge, high rise building, etc.) to the lower layers of soil. Quality control and quality assurance has been a popular, yet challenging task for geotechnical engineers, inspectors, and piling contractors, mainly because these elements are generally buried under ground, with only pile head being accessible most of the time. Different intrusive and non-intrusive methods have been developed over the past decades to help engineers with easy, reliable and cost-effective evaluation of quality in these elements. Pile Integrity test is referred to a group of nondestructive tests that aim to provide quantitative data on physical dimensions of pile elements, their continuity, and last but not least, consistency of the pile material. Pile integrity test (PIT), or as ASTM D5882 refers to it as "low strain impact integrity testing of deep foundation is a widely used nondestructive test method for the evaluation of pile quality, integrity and to help estimate the unknown length of existing piles and foundations. Pile integrity test can be either used for for forensic evaluations on existing piles, or quality assurance in the new construction. 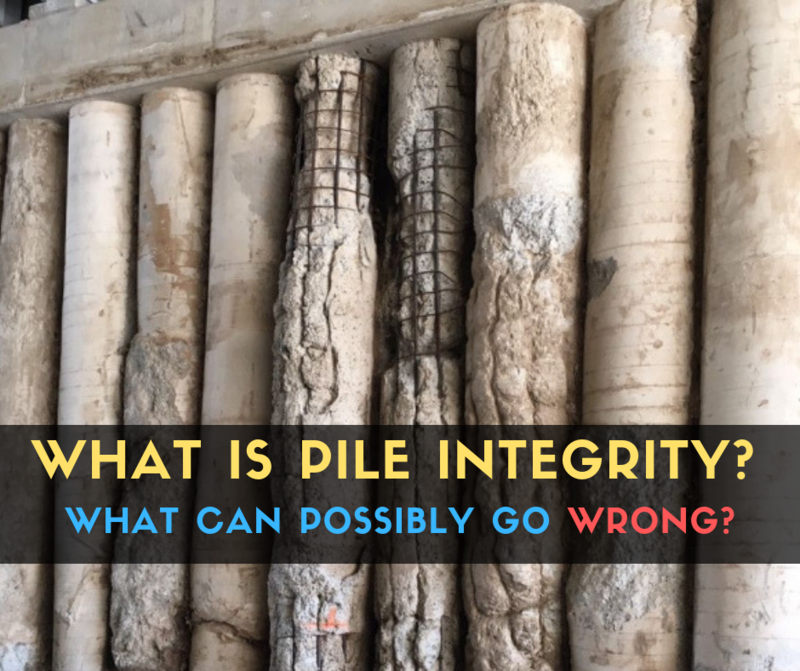 The integrity test is applicable to driven concrete piles and cast-in-place piles. 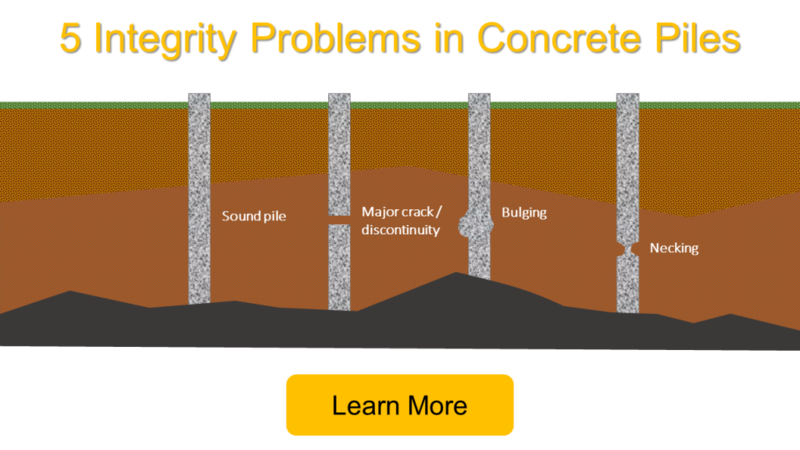 The following image provides a visual summary of major integrity issues in deep foundations. Low strain impact integrity testing provides acceleration or velocity and force (optional) data on slender structural elements (ASTM D5882). Sonic Echo (SE) and Impulse Response (IR) are employed for the integrity test on deep foundation and piles. The test results can be used for evaluation of the pile cross-sectional area and length, the pile integrity and continuity, as well as consistency of the pile material; It is noted that this evaluation practice is approximate. The PIT method works best for column type foundations, such as piles and drilled shafts. The method provides a rapid and simple tool for evaluation of a number of piles in a single working day. 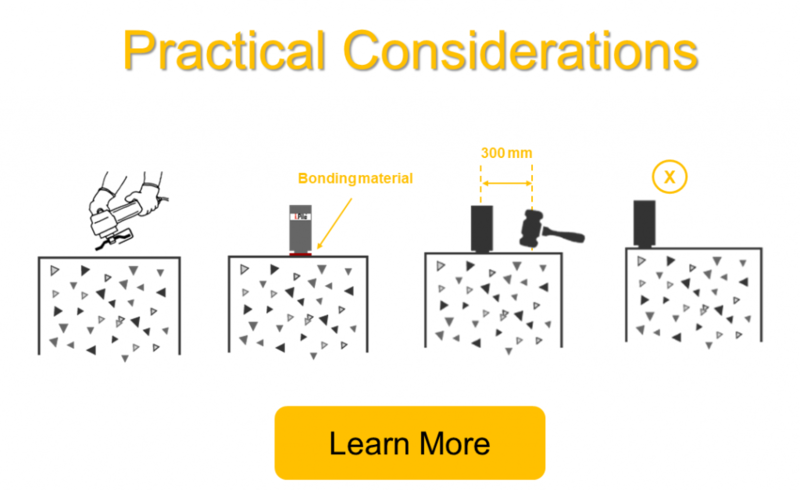 Surface preparation is the first thing to do when performing a pile integrity test. Any type of contamination should be removed (using a grinder) to reach to solid and sound concrete surface. The pile head surface should be accessible, above water, and clean of loose concrete, soil or other foreign materials resulting from construction. This step is so vital, because then connection between the sensor and concrete should be solid (firm contact). The acceleration sensor should be placed on concrete firmly. To do so, a couplant material should be used to attach the acceleration sensor the pile head. 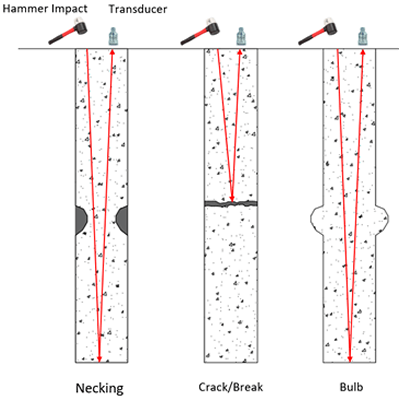 An impactor (usually a hand-held hammer) is used for impacting pile head; the impact should be applied axially with the pile. Motion transducer should be capable of detecting and recording the reflected echos over the pile top. Acceleration, velocity, or displacement transducers can be used for this purpose. At the minimum, acceleration transducer should have an Analog to Digital Converter with 12 bit resolution; and a Sample Frequency of at least 25 KHz. The location of the sensor should be selected away from the edges of the pile. The integrity testing should be performed no sooner than 7 days after casting or after concrete strength achieves at least 3/4 of its design strength, whichever occurs earlier. + PIT can not be used over pile caps. + It does not provide information regarding the pile bearing capacity. + Test should be undertaken by persons experienced in the method and capable of interpreting the results with specific regard to piling. + It is not effective in evaluating sections of piles below cracks that crosses the entire cross sectional area of the pile. This entry was posted in Construction, NDT, Piles and Foundations, Ultrasonic Testing and tagged Concrete Pile, Piles. Bookmark the permalink. Your comment on pile integrity test appreciated. We shall be glad to acquire the equipment capable to generate image of the pile in the ground. In addition to the length and diameter along with other information that dictate the integrity of the pile. Kindly furnish us the cost of various brand of pile integrity test equipment available in your company. As a Geotechnical engineer consultant I would probably purchase the equipment. Could you please informe me it`s cost. what is the maximum pile depth can be handled with this test? Thanks for explaining how the pile integrity test sends a shock wave that travels the length and will set up secondary reflections to be sent with the return signal if there are any defects or discontinuities. Properly inspecting the piles and other parts of your project would probably be important to ensure that they’re stable and in good condition. In order to get the most accurate results and ensure you understand what they mean, it would probably be important to hire a professional company for installation and the other services you require so you can avoid problems. ” PIT “, has been recommended by me for Pile Integrity Tests for most of the Pile Installations, with my recommendations on ALL the Projects as executed, as also those ongoing, with myself being Consulting Structural Engineer. I would like to know, whether this system, can be deployed, indirectly, for verification of continuity of Concrete Mass, in RCC Columns, post their construction ?